I would not typically describe myself as a reviewer or things. Sure, I develop strong opinions that are hard to be swayed and I have no problem sharing (forcing) those opinions on any unfortunate creature within earshot, but I am no critic. That being said, when I was approached by the fine folks over at Limitless Adventures to take a look at their stuff, I was slightly apprehensive. I am, after all, but a simple bard with a verbose vocabulary and an occasional nugget of wisdom buried within my incessant ramblings. However, when they said "random encounters", I was sold. You know how I feel about random encounters. #RPGaDay 2016 - Day 29: If I Could Game Anywhere On Earth, Where Would I Choose? Day 1: Real Dice, Dice Apps, Diceless, How Do You Prefer To 'Roll'? Day 5: What Story Does Your Group Tell About Your Character? Day 7: What Aspect Of RPGs Has Had The Biggest Effect On You? Day 28: Thing You'd Be Most Surprised A Friend Had Not Seen Or Read? #RPGaDay is getting steamy! Day 29 would be tickled pink to know if I could game anywhere on Earth, where would it be. Well, this one might get a little... dark. #RPGaDay is going strong! Day 28 beseeches me in its pondering of what thing I'd be most surprised to discover a friend had not seen nor read. Already, right off the bat, we must exclude Star Wars from this rambling. For no other reason than the bitter truth that if you have never seen Star Wars, we are not friends. 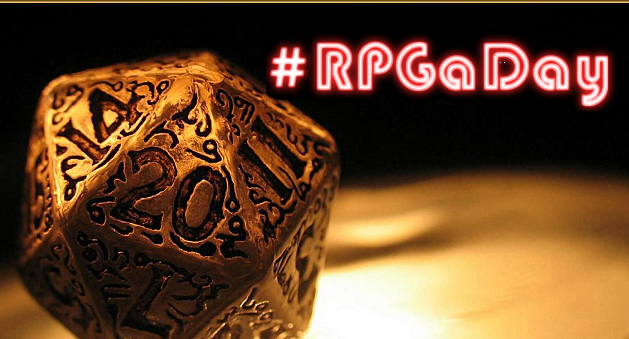 #RPGaDay just cannot be denied! On day 27 I am asked what the most unusual circumstance or situation in which I have gamed has been. For many other days this month, I have had to sit and ponder, but for this one, it was an instant jolt to the memory. It was the very end of summer. Autumn's crispness, the kind that is most prevalent here in New England, was just beginning to creep in. My gaming group at the time consisted of several guys from work and a few others that were friends of other members of the group. The adventure; a staple stories and legends since time immemorial. Odysseus, Hercules, Bilbo, Captain Reynolds, each had their fair share of adventure, and each has been tested to their limit by said adventures and come out on the other side better (or in Mal's case, better and bitter).That, in a sense, is the purpose of an adventure. To challenge us and make us greater than what we were before. It is no wonder that role-playing games are primarily centered around the adventures of a small group of people able to do extraordinary things. As every adventure starts somewhere, so too does every adventurer. Today we will discuss the benefits and challenges of writing a game for low-level characters, and how to write them effectively. #RPGaDay 2016 - Days 8-26: The Catch-Up Game! #RPGaDay keeps on trucking, but I seemed to have stopped trucking hard. In an attempt to play catch up, I offer you this multi-day-mega-blog! Next time I commit to this, I will hopefully not be moving right after Gen Con. While digital is the format I implement the most, and softcover is easiest to haul out, there is nothing quite like the creak and feel of a brand new hardcover book. Also, the weight. weight is good. If you run out of monsters you can hit your players with it! #RPGaDay 2016 - Day 7: What Aspect Of RPGs Has Had The Biggest Effecct On Me? A week into #RPGaDay, and on this seventh day, I am asked what aspect of RPGs has had the biggest effect on me. For me, the biggest aspect that has helped mold my style of play and the way I run games would have to be the notion that an RPG is a collaborative storytelling experience. That is to say, RPGs are run by a Game Master, but every person at the table has a hand in how the story turns out, what it is about, and how it ends. Day 6 of #RPGaDay beckons to my altruistic side and asks what the most amazing thing my gaming group has done for the community. This proves to be the toughest of the days thus far because, as a group, we really haven't done much for the community aside from keeping mentally disturbed people off the street for 5-6 hours a week and give potential serial killers a very distracting hobby. Day 5 of #RPGaDay demands to know what story my group tells about my character. There are many tales, most being about NPCs I have run, but, since the wording specifically states "character", that is what you shall receive. And surprise, it's a bard. My first foray into 5th Edition D&D was only a couple of years ago. I had been wanting to try it out since it's release, hoping it could redeem itself from the days of 4th Edition (may we never speak of it again). In that game, I decided to venture outside my comfort zone of fighters, barbarians, and dwarves to focus on a class and race I had never played before; a half-elf bard named Roth. Day 4 of #RPGaDay wants to know what the most impressive thing I've seen another character do. For me, impressive can mean a lot of things. It could be an incredible feat or achievement, a moment of severe badassery, or just a dramatic moment that cannot help but evoke a "whoa" from my powerful lips. "So much of my authority is derived from the power right here." But what really impresses the bard is something that cannot be captured on a character sheet or quantified with mechanics. It is good old-fashioned role-playing. And by far, the most impressive thing I have ever seen at a table was when the barbarian schooled the fighter in tactics. Day 3 of #RPGaDay pries into the lives of not my NPCs, but one of my own characters, and asks, "What was your proudest character moment?". In a long and storied role-playing career, one creates an untold number characters, each with their own tales and memorable moments. It is hard to pin down a singular moment above all the others. How does one gauge such a thing? Usefulness? Badassery? Comedic value? For me, the moment I am most proud of was when I saved the day. It has happened only once in my RPG career, but when it happened, it was beautiful. The game was run by my best friend, Kenn, and was set in the Forgotten Realms. We were new citizens of Waterdeep, having each just come to the City of Splendors for our own reasons. I played the dwarf fighter-turned-battle rager; Grundy Thunderfist (I still love that name). #RPGaDay 2016 - Day 1: How Do You Roll?